Running is an extremely popular type of high impact, cardio activity. It is a highly effective way to burn calories and get fit. It also brings with it a wide range of both physical and psychological benefits, helping to strengthen the heart and lungs as well as improving stability and balance. 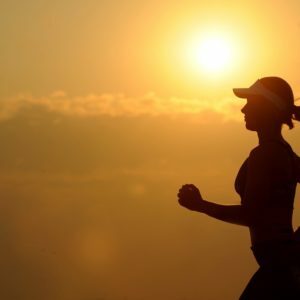 Some studies suggest running also improves bone density and a range of psychological benefits have also been documented, from elevated mood (runner’s high), to increases in memory and concentration. Running is classed as a high impact activity; a type of sport which causes an impact of approximately 2.5 times the weight of the individual, and in most instances both feet are off the ground at the same time at some point during the activity. Other high impact sports include football, gymnastics, tennis, skipping and boxing. Low impact activities are categorised as activities in which at least one foot always remains on the ground. No impact activities are where the body is fully supported, such as swimming, cycling and other elliptical training. Although high impact activities bring with them the wide range of aforementioned benefits, too much high impact, however, can put an excessive strain on the weight bearing joints of the body, in particular, the knees. 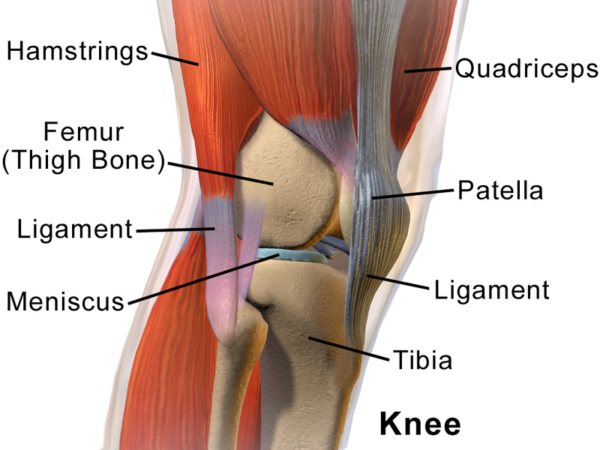 The knee joint is one of the largest and most important joints in the body. It is also one of the most susceptible to wear and tear injuries, as it has to bear the weight of the body whilst in an upright position. A type of modified hinged joint, the knee joint comprises of the patella (kneecap), and the medial and lateral tibiofemoral articulations. The patella rests in a groove located on the front of the femur (thigh bone), this is sometimes referred to as the patella groove or the trochlear groove. The medial and lateral tibiofemoral articulations describe the soft tissues of the knee joint, this includes the ligaments, tendons and muscles, these link the femur with the tibia (shin bone), as well as helping to stabilise the knee joint. The surroundings of the joint are covered by a thin lining of tissue called the synovium whose tough outer layer helps to protect the joint. The synovium also contains synovial fluid which helps to lubricate the cartilage and reduce friction during movement. Runner’s knee is a blanket term used to describe several possible conditions which cause pain around the area of the kneecap. 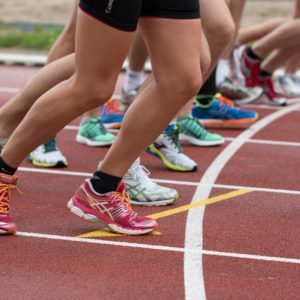 Although it is called Runner’s Knee, due to the high incidence of the condition reported by runners, there are a number of other activities, such as skiing, football, cycling etc. which also exert stress to the knee joint, resulting in similar symptoms. This typically manifests as a result of altered biomechanics and muscle imbalance or can be due to inflammation or irritation of the cartilage behind the knee caps, where the patella articulates with the femur. It is often thought to occur due to excessive stress applied to the joint during high impact activity. Symptoms often worsen during physical activity. The iliotibial band (IT band) refers to a band of connective tissue which extends from the hip to the outside of the knee joint. It serves to extend, abduct, and laterally rotate the hip as well as assist in stabilising the knee joint. Iliotibial band syndrome describes lateral knee pain and occurs when the IT band becomes inflamed or tight. 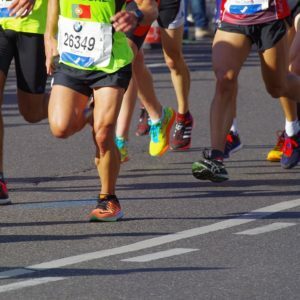 It is a commonly reported repetitive strain injury in runners. This condition describes the softening and gradual breakdown of the cartilage on the underside of the patella, causing the patella to friction against the femur when the knee is in a flexed position. This results in painful symptoms often described as a dull ache or a grinding sensation. This condition is often associated with overuse of the knee during high impact sports, it may also occur as a result of an abnormality of the knee. Over the counter pain relief medication such as NSAIDS (ibuprofen) and analgesics (paracetamol) may provide short term pain relief. Unfortunately for many, Runner’s Knee can persist for long periods of time, interfering with sports training and other activities. Physiotherapy is often a highly beneficial form of treatment – conditions such as patellofemoral pain, respond well to physiotherapy. Specific stretches and hands on manipulation can help to gain full strength and range of motion to the knee. It can also help to identify and correct any postural or gait issues, as well as assessing running technique, and correcting possible biomechanics which may be responsible for the problem. Targeted physiotherapy can work with specific muscle groups and help find exercises which aren’t too painful to do. Pain is often a major inhibitor in the recovery process, therefore, appropriate instruction and supervision is necessary as the wrong exercises may exacerbate the issue. Some people may experience Runner’s Knee due to excessively collapsing the arches of their feet, and orthotics may be necessary. In some severe cases, where all conservative treatment methods have failed, surgery may be an option. ProPhysiotherapy offer a wide range of sports therapy related services – our physiotherapists are highly trained specialists and can provide a range of treatments and advice on painful knee associated disorders. Get in touch today for more information. I started practicing pregnancy pilates quite early on in my pregnancy and it has proved invaluable. Susie’s gentle yet effective techniques are perfect for stretching out a sore back and also strengthening those all important pelvic floor muscles. Her warm and friendly personality makes the class fun and something I look forward to each week.